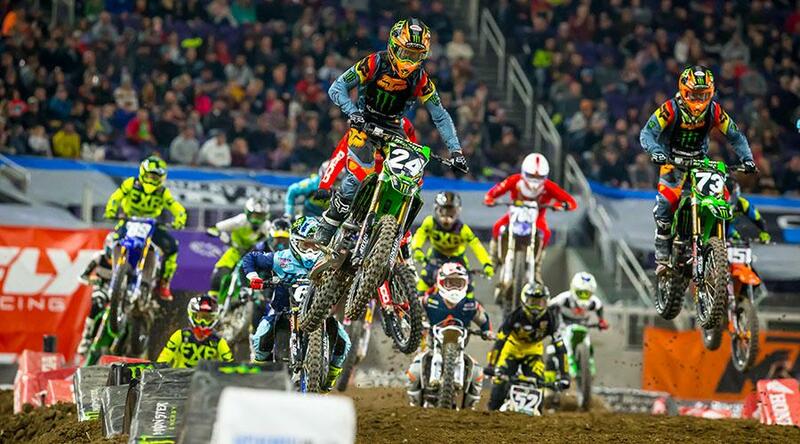 The Monster Energy AMA Supercross series headed East for Round 6 at US Bank Stadium in Minneapolis. The event featured the opening night of the East Coast 250 class. Cold February temperatures outside did not deter the large enthusiastic crowd from coming out to show their support. Riders were happy to be inside with no mud. The well-prepared track offered multiple passing options, especially in the rhythm sections. Austin Forkner(24) started out the night showing signs of the speed we saw from him last year. 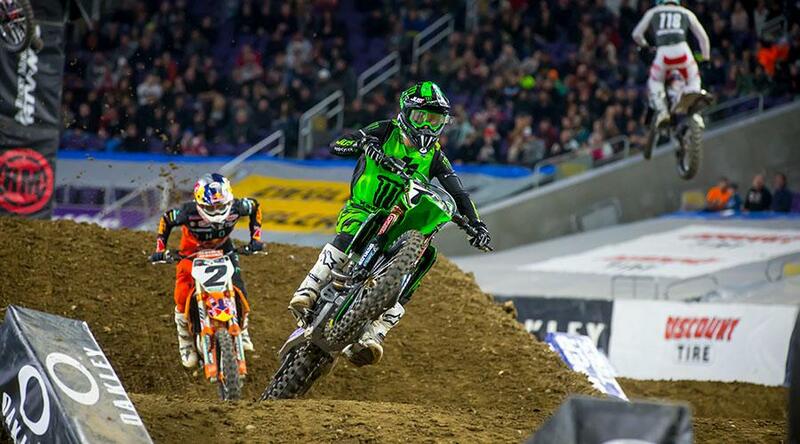 He carried that into the main event, starting with the holeshot and building a lead of several seconds. Austin appears to be a much more composed rider this year. Guarding the top spot and leading for all 20 laps, he finished with a six-second margin of victory. Austin’s skill combined with continuing experience may be what leads him to a championship season. It will be fun to watch his progression. Top qualifier Jordan Smith(28) showed some good speed and finished in 2nd. Justin Cooper(32) took 3rd with a solid ride. Alex Martin(26) placed 4th, including a blistering lap of 42.740 seconds. 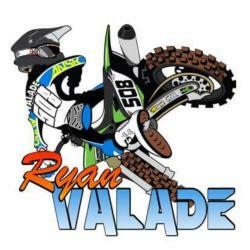 The fastest lap of the 250 main by almost six seconds. 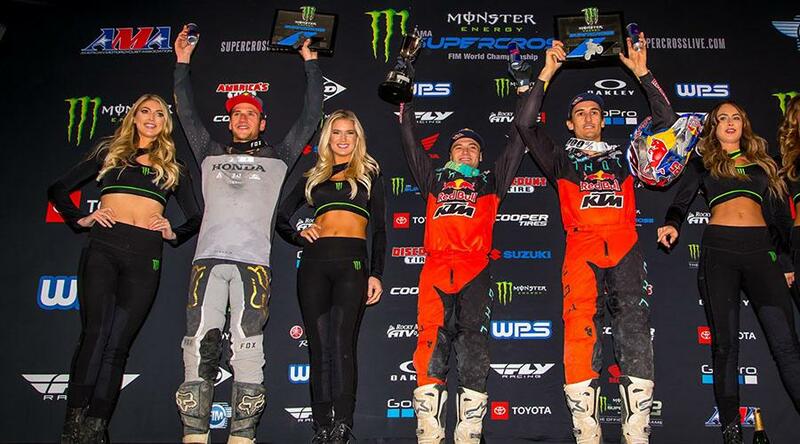 The 450 class provided the same excitement we’ve seen all season. Riders in both heat races battled hard right from the start. 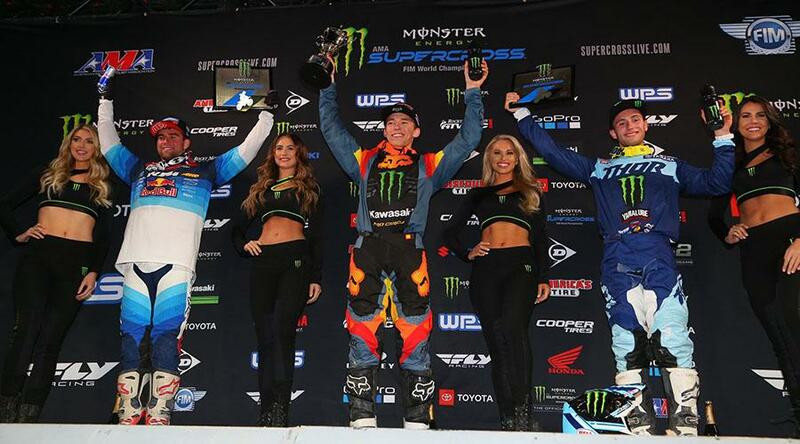 Cooper Webb(2) and Justin Brayton(10) captured the wins. Webb was the fastest qualifier and he took the holeshot in the 450 main. 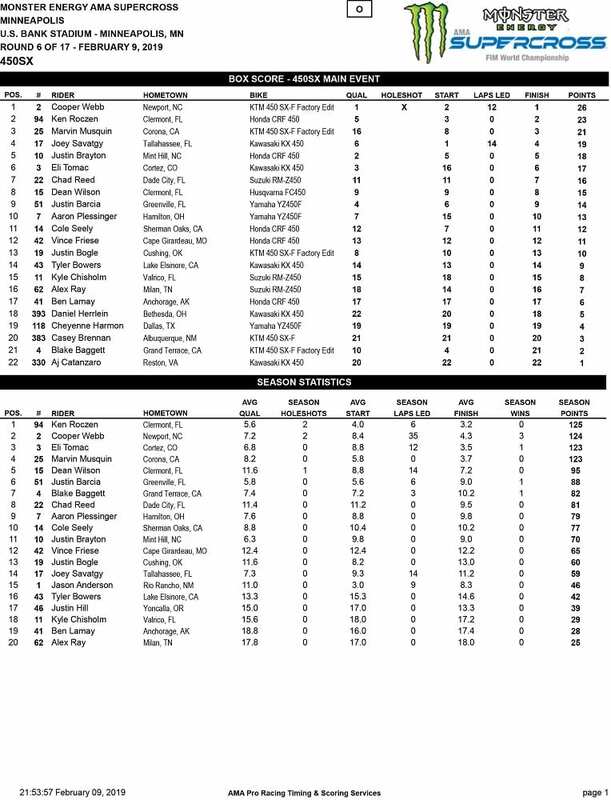 Joey Savatgy(17), Ken Roczen(94), and Blake Baggett(4) vied with Webb for the top spot. 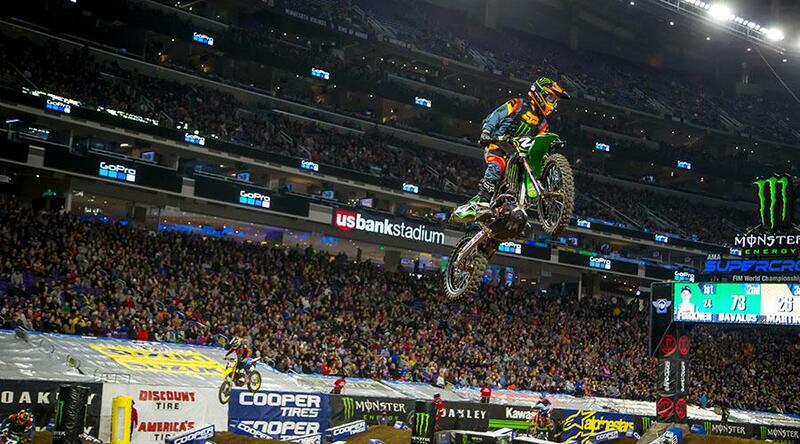 Savatgy captured the lead and stayed out front for 14 laps. But pressure from Webb won out as he moved to the front and held off challenges for the final 12 laps. 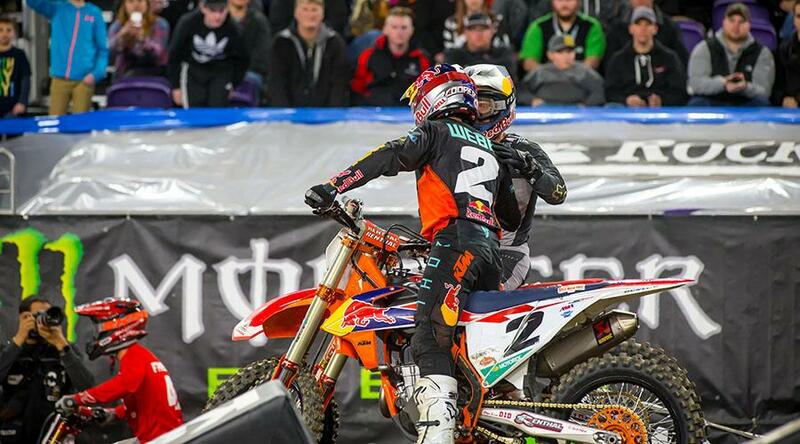 Roczen fought his way to a solid 2nd place. Marvin Musquin(25) worked his way through some great competition to earn a podium spot in 3rd. 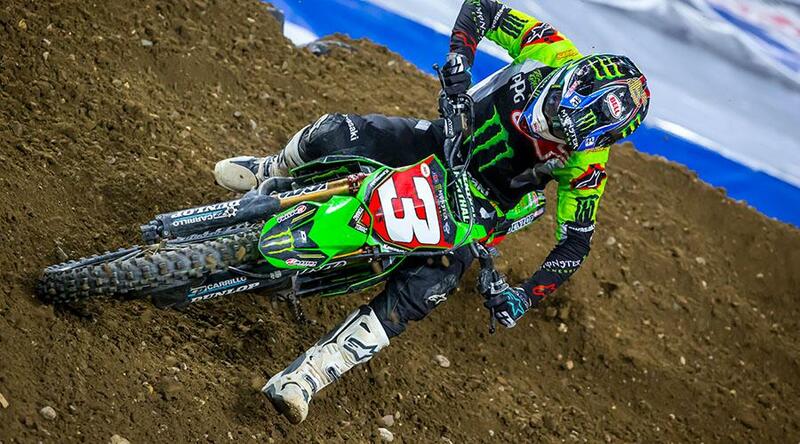 Eli Tomac(3) started way back in the pack and could only manage a 6th place finish. Leading to a complete juggling of the points standings. 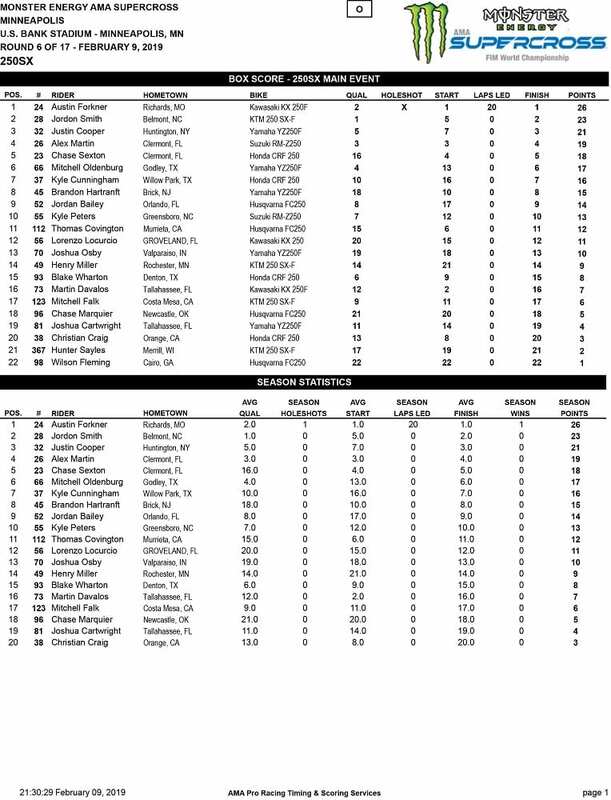 Ken Roczen, by virtue of his 2nd place finish, took over the lead in the 450 SX season standings with 125 points. Followed closely by Webb in 2nd, one point back. A tie exists for third between Musquin and Tomac at 123 points. This leaves four riders within two points of the top spot heading into the next round at Arlington Tx this coming Saturday night.